Homemade Guacamole is an alltime favourite for summer days. It is super easy and fast to make, we serve it as a light lunch, as snack or as a dip for a barbecue. 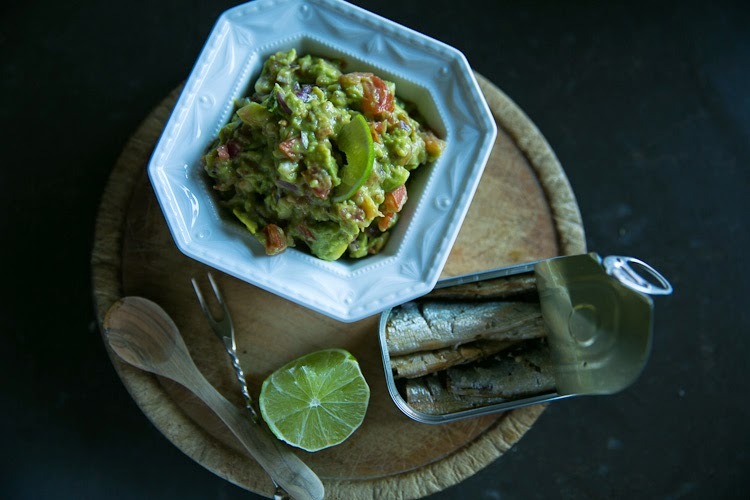 Yesterday we spread our guacamole on slices of rye bread and topped it with sardines. The avocado contains all 6 human nutritional needs in abundance: water, fat (essential natural fats), protein, natural sugar, vitamins (B,C, E and K) and minerals (potassium, calcium, iron and phosphorus). Rich in monounsaturated fatty acids the avocado helps to reduce levels of "bad" cholesterol in the blood. So don't be fooled by avocado's bad reputation as a high-fat food, actually it provides us with unique health benefits. I don't use the blender to combine the ingredients, but smash the avocados with a fork, add the remaining ingredients and season with pepper and salt.